Here we go, day 2 of the mole removal with Apple Cider Vinegar. 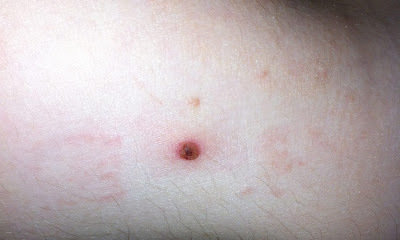 As you can see above the ACV is definitely having an affect on the mole. The centre of it has turned ever so slightly black and around the outside of the mole has gone at little red from the ACV touching the skin. Not worried about that though and glad to see that this is actually working. I did the same process as yesterday by scratching the mole with a sewing needle, surrounding the outside skin with Vaseline to reduce redness, applying some ACV with a cotton bud, cutting a tiny square just larger than the mole itself and dipping it into the ACV until it was soaked through then applying it over the top of the mole and placing a band aid on top to keep it in place. This process was again repeated in the morning for 1 hour, about 5pm for 1 hour and again before bed in which I kept it on overnight. The mole did bleed again slightly when roughing it up with the needle and it stung when the ACV made contact with the skin but nothing to sore, mostly just uncomfortable. So far it is looking good, fingers crossed.